Camporado is a Filipino rice porridge. It’s usually made of glutinous rice and tablea, or our very own local chocolate, smothered with milk and best paired with tuyo or fried dried fish. Imagine the sweet deep flavor of chocolate paired with the salty savory dried fish. I bet most of you consider this as your breakfast or snack comfort food. But not me. I’m not a fan of champorado and I’m more of a lugaw or goto fan. To be honest it’s my least favorite. I don’ know why it’s just not my thing. Most of the people I know love champorado with tuyo on the side. I can imagine it is appealing but lugaw is still the best. Last Saturday night, I’m thinking of something to cook for Sunday lunch and champorado suddenly came up to my mind. It’s a breakfast or snack dish why did it cross my mind? Then, another dish came into my mind, maki. I love maki and sushi and it’s been a long time since I prepared this dish. I thought of preparing it but the ingredients are expensive, the Japanese rice, rice vinegar and the filling. Then, it hit me. Why not champorado rolls? 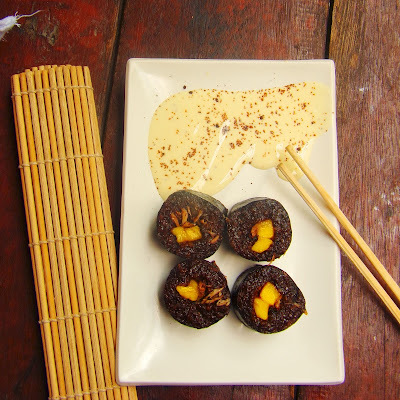 That is, champorado in seaweed wrapper and prepared like maki. I went to the grocery and bought a seaweed wrapper and asked my mom to buy mangoes and glutinous rice on Sunday morning. I soaked the glutinous rice for three hours and cooked it like a regular rice. When done, I mixed the chopped chocolates and white sugar. I prepared the filling while cooling the rice. The dried fish is boiled in water and vinegar. Then, I removed the scales and deboned it. Also, I sliced the mangoes and everything is ready. Then, I placed the rice onto the sheet, placed the filling and wrap it. Then I prepared a simple cream sauce to go with it. The champorado rolls then can be dip in the cream sauce and chili powder can be added to the cream sauce to give it a kick. Wash the glutinous rice twice. Soak in 3 1/4 cups water for 3 hours. Cook the glutinous rice the way you cook your regular rice. When the rice is done, add the chopped chocolate and sugar. Mix until everything is coated with chocolate. On a saucepan, place the dried fish, water and vinegar. Then, boil and simmer for 5 minutes. Remove from heat. Remove the scales and bones of the fish. Don’t forget to disregard the head. Flake the fish meat and set aside. Prepare the mango, remove the skin and slice the mango flesh into sticks. Place the nori sheet on a sushi mat. Place the chocolate rice about 3/4 cm thick with 2 inches allowance on the far end and 1 inch allowance on the end near you. Line the flaked dried fish and sliced mango below the center of the nori sheet and roll. Divide into 8 parts. For the dipping sauce, place the cream, sugar and nutmeg in a saucepan and gently simmer for 10 minutes. Transfer in a bowl and add a dash of chili powder. Then, enjoy your champorado rolls.